Avid poster collector, Andrew Hawley, announces his search for original Zed Zeppelin Seattle Center Coliseum fillmore era concert posters. By 1970, Led Zeppelin from England had established itself as one of the top rock groups in the world with its hard charging heavy metal music. The poster measures approximately 14x22 inches and was printed locally. It features a Union Jack flag motif in its design. Fillmore rock posters are more about an era of music verses a particular poster layout or graphic style. Andrew Hawley, from Vintage Rock Posters, is a serious buyer of original 1950's and 1960's fillmore era concert posters. He is announcing his search for an original Led Zeppelin concert poster from the Seattle Center Coliseum show held in Seattle, Washington on September 1, 1970. According to Hawley, "The poster measures approximately 14x22 inches and was printed locally by Exit Art. This poster is a good example of a fillmore style rock concert poster. Fillmore rock posters are more about an era of music verses a particular poster layout or graphic style. These posters are named for the bands and music played at the Fillmore East promoted by Bill Graham. This rock music meca was located in the East Village neighborhood of the Manhattan of New York City. Zed Zeppelin was a leading English based band in the late 1960’s and throughout the 1970’s. 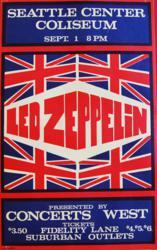 The Zed Zeppelin poster features a British Union Jack theme. The band was very popular in U.S. and introduced heavy metal rock to the world." Hawley adds, "The Seattle Led Zeppelin concert promoter was Concerts West. They were responsible for concert promotion throughout the U.S. Led Zeppelin was no stranger to the Seattle area. Previously, they had played at The Aqua Theatre and the Seattle Pop Festival. At the Seattle Pop Festival, they shared the stage with rock ‘n’ roll legends such as Chuck Berry and Jim Morrison and The Doors. The 1970 Led Zeppelin concert at the Coliseum was an incredible show with more than 500 posters printed and hung locally to advertise the concert. Handbills were also distributed for the show using similar artwork but printed on a thinner, glossy paper stock." Hawley is willing to pay $3,000 cash for the Led Zeppelin September 1970 Seattle concert poster or any other 1969-73 original Led Zeppelin concert posters. Please call 310-346-1965 or email Hawley at andrew(at)vintageconcertposterbuyer(dot)com.